Casalunga golf resort is a place of harmony and relaxation, ideal for those who would like to take a break from the stress of the city and work. 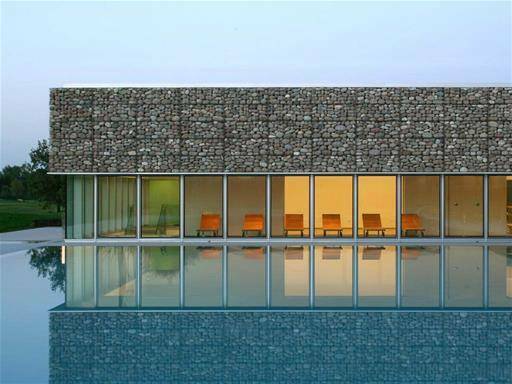 Visitors can expect to experience authentic moments of wellness when they enter this resort just a few miles away from Bologna. What makes this place so special is not only the well-kept golf course, which extends through a surface of 3010 meters, or the excellence of their cuisine, but the contribution to the atmosphere that is created by the design of the interiors. From the projection of the spaces to the furnishing, everything has been considered to the smallest detail to create a truly unique stay. The 24 available rooms inside the resort have been projected, some in a classic style, others in a contemporary one, in order to meet the demands of their customers. A luxurious project worth of the contractor, Gianluca Vacchi. 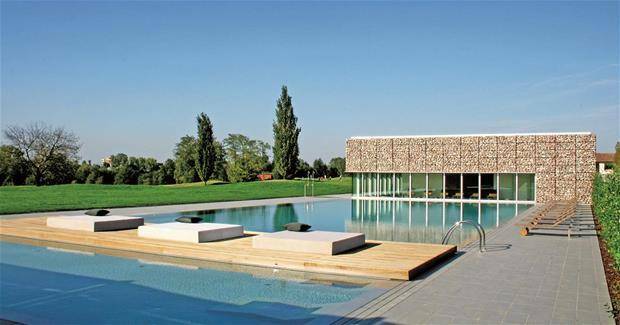 The golf course, located in a green Emilian countryside, has been repurposed starting from a former gravel quarry near a river. Once the activities of the quarry were shut down, the area has been created artificially as well as the lake on the inside of the golf course. The terrain has been oriented in a north-south pedestrian route, which is delimited by ropes and transforms it into the focal point of the entire project. Then, in the middle of the green, the pool: a unique relaxing angle that is located in one of the most suggestive parts of the structure. In the same area we have the area used for the solarium. All of it creates a state-of-the-art wellness center that counts with every comfort to relax and keep a clear head. As for the buildings, these host the reception, the fitness center, a spacious dressing room, the club house, a solarium, an open bar and the room areas. All the buildings have been projected in order to allow a view over the golf course through vast views, for example, the club house has been elaborated with a volume completely made of crystal, which gives a perfect integration of the new building and the surrounding space. The respect for the memory of the place has convinced architects of not building anything taller than the pre existing colonial houses, though the materials have been chosen to integrate with the nature of the territory: cobblestone collected from the river and wood are the most present materials inside the resort. During the design phase they have also taken care of the technical aspects in order to optimize the energy consumption. All the solutions applied have brought a 30% of energy saving compared to the more traditional solutions. Some of the strategies used are, for example, the windows with a high coefficient of thermic isolation, both for avoiding overheating during the summer and to keep the indoors area warm during winter, a line of trees positioned along the east part of the buildings reduces the overheating of the architectonic materials, and pergolas are situated on the entrance of each building in order to avoid direct irradiation. The design of the external space allows, if necessary, to transform these ambients into places for events that can host hundreds of people: musical events and spectacles are organized constantly during the holidays to entertain their clients. Moreover, there are three elegant rooms in the inside structure that can be used for company meetings and other events. The beauty of the location makes it perfect for it to be used for events such as marriages, for which there’s a special terrace on the lake used for the celebration of the ceremony. There are in fact six isolated areas inside the structure that can be rented all together or separately. Tutto questo progetto è stato gestito da: Antonio Iascone ingegneri architetti Antonio Lascone (chief of project); Andrea Padani (team leader); Francesca Galasso, Silvia Malaguti, Sara Mazzoli (team); Raffaello De Gennaro, Nicola Lannucci (modelling and rendering). The internal and external furnishing has been provided by: Intek, Modular, Domodinamica, Sdr engeneering.